The Trump administration issued a series of new sanctions on the embattled regime of Syrian President Bashar al-Assad ahead of what U.S. officials believe is an "imminent attack" by the regime with help from Russia and Iran, according to an announcement by the Treasury Department. The new sanctions will target four individuals and five entities tied to the Assad regime that are believed to be conducting weapons shipments and financial transactions supporting upcoming attacks against civilians. "Millions of innocent people in Idlib province are currently under the threat of imminent attack from the Assad regime, backed by Iran and Russia, under the pretense of targeting ISIS," Treasury Secretary Steven Mnuchin said in a statement accompanying the new sanctions. "At the same time, the Assad regime has a history of trading with the terror group … The United States will continue to target those who facilitate transactions with the murderous Assad regime and support ISIS." One of the newly sanctioned individuals, Muhammad al-Qatirji and his company Qatirji Company, maintain "strong ties to the Syrian regime and facilitates fuel trade between the regime and ISIS, including providing oil products to ISIS-controlled territory," according to information provided by the Treasury Department, which oversees and enforces sanctions. "Al-Qatirji and his company have been found to be working with ISIS militants and also maintain a strong working relationship with multiple officials within the Government of Syria," according to the announcement. "The Syria-based Qatirji Company is a trucking company that has also shipped weapons from Iraq to Syria," the United States found. 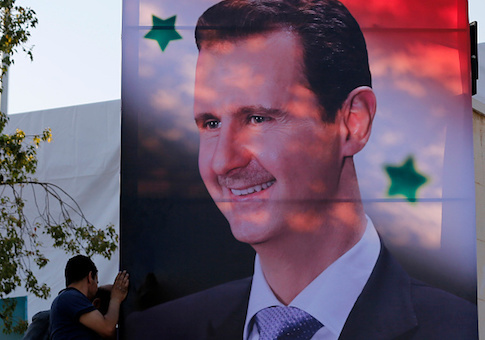 Other sanctions have targeted the Assad regime's fuel and shipping procurement networks. This entry was posted in National Security and tagged Bashar al-Assad, Syria. Bookmark the permalink.